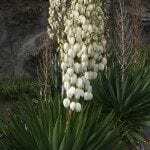 Upon maturation, yuccas grow a large stalk that flowers and bears fruit. It's done now, and ugly. Can I cut the stalk off without killing the plant? Any extra supplements to add after removing the stalk? Can't kill it, as my wife will kill me shortly thereafter.